BelarusDigest > All > Belarus: No Appetite for Revolution? Belarus: No Appetite for Revolution? The political year for Belarusian opposition will begin with a traditional rally on the so called Freedom Day 25 March. This day, which celebrates proclamation of the Belarusian People's Republic in 1918, in the past was bringing to the streets of Minsk thousands of people opposing the government of Alexander Lukashenka. This year, no massive attendance is expected. Even the November presidential elections – unlike in 2006 or 2010 – will probably not cause serious post-election protests. Developments in neighbouring Ukraine seriously changed the calculus of political change in the Eastern European country. The Ukrainian crisis forced the government, opposition, Russia and the West to look differently at the power struggle in Belarus. Addressing high-ranking police officers on 5 March, the Belarusian President said there would be no 'Maidan' protests (i.e. Colour Revolutions) in Belarus. Two days later, the Belarusian People's Front, one of the nation's opposition parties, proposed to abandon its plans to hold 'Maidan' protests following the November 2015 presidential election. Inspired by the success of the Colour Revolutions elsewhere, the Belarusian opposition has on multiple occasions tried to oust Lukashenka through post-election protests. They have failed, however, as the main prerequisite for it is a fragile and dysfunctional state. This year, a successful anti-regime protest movement is even less likely. Unlike in the past, no serious international players will risk a "revolutionary" scenario. Still, provocative actions by a few remain a distinct possibility. Were clashes to occur following the announcement of the election results, the situation in the country would only take a turn for the worse. Lincoln Mitchell, who for many years worked for the National Democratic Institute in post-Soviet nations, has recently published a critical book on Colour Revolutions. He argued that "by the spring of 2006 Belarus was one of the few countries in the world, certainly the only one in the former Soviet Union," where Washington sought regime change. Even though post-Soviet regimes such as Kazakhstan, Azerbaijan, or Uzbekistan had greater problems with human rights and democracy, it is Belarus that was branded Europe's last dictatorship by the United States. Because Belarus possessed little strategic value to the United States, it was often dismissed as a murky Eastern European state under Russian control. The only purpose Belarus served was to showcase Western commitment to human rights, democratic freedoms, and nuclear non-proliferation. As of 2015, the geopolitical situation has changed. As the Belarusian president is happy to boast, and the opposition readily complains, the West has viewed Belarus in a different light following the onset of the conflict in Ukraine. According to Yanukevich of the BNF party, Western governments are now telling Belarusians that independence should come before democracy. With the emergence of a new power constellation in Eastern Europe, the West has formulated a new strategic task for Belarus – to avoid a Russian takeover. At the same time, Belarusian cooperation with the Middle East has become less of a problem for Washington both due to the changes in the Middle East, such as the multilateral negotiations with Iran, and thanks to the more cautious approach taken by Belarus with regards to its foreign policy. In particular, in the early 2010s Minsk minimised its contact with Iran and Syria as these countries faced increased international isolation. Only after the international standing of Iran and Syria had improved and their talks with Russia and the West had resumed did Belarus reactivate its contacts with these states. The recent United States' decision to lift sanctions on the Belarusian national oil company Belarusnafta is just the latest proof that Minsk has managed to sort out its Middle Eastern affairs. When explaining his appeal to not flood Minsk's central square in November 2015, chairman of the People's Front Alyaksei Yanukevich said that few people would participate. According to him, Belarusians fear a repeat of the Ukrainian scenario in Belarus. Yet the problem lies not only, if at all, in concerns about what happened in Ukraine. All these years, the Belarusian opposition has misapplied the lessons of protests in Ukraine, Georgia and Kyrgyzstan in Belarus. Belarusian circumstances were, and are, very different than the circumstances in the countries where the colour revolutions had "won". When the government effectively controls society and provides people with many essential services, post-election protests are unlikely to produce a change at the upper echelons of the state. Mitchell lists four main premises for that have lead to these colour revolutions. First, an opportunity to effectively participate in an election and making a plausible claim about the opposition's victory. Second, the media should be able to anticipate election fraud, to inform the people when such fraud is inevitable as well as cover the ensuing protests. Third, the population should not be intimidated by the state. Fourth, in cases where colour revolutions are successful, foreign and international donors and democratisation-oriented NGOs have “a degree of political access and involvement in the countries where they work[ed] that would never be tolerated in their own countries.” None of these conditions apply in Belarus. Sitting on a Barrel of Gunpowder? To sum up, a successful colour revolution is impossible in Belarus. There is some probability that protests will occur, however, and this is not necessarily good news. As the Belarusian left-wing Prasvet web-site has recently commented, all the recent talk about election fraud has led to the opposition losing interest in working with the public. It lamented, "The mobilisation [of radical forces] still supercedes agitation, and popular support for opposition remains what it was five years ago." The events in Ukraine has led many Belarusian activists to believe in the efficacy of radical rhetoric and methods, regardless of the mood of ordinary citizens. At the same time, the developments in Ukraine have influenced Belarusian law enforcement bodies and the state security apparatus. They may now be more willing than ever before to resort to extreme measures in order to defend the government. Russia may also be prepared to respond more radically to any new post-election protest in the former Soviet nations. Were a radical provocation by a minority group to lead to a bloody clash in the wake of the 2015 presidential election, Belarusians would only suffer to lose from it. The political regime in the country would become more brutal, its politics more radical, and Belarus's relations with the West would deteriorate once more. Yet, the appearance of radical nationalist initiatives such as 1863x.com suggests that such a scenario may not be as far-fetched as it might appear. Siarhei Bohdan is an associate analyst at the Ostrogorski Centre. While European and American officials are visiting Minsk and discussing easing sanctions on Belarusian officials, the KGB is preparing for this year's presidential election. In recent months the police have stepped up pressure on civic activists and anarchists to avoid protests spilling out onto Minsk's pristine streets during the upcoming election campaign. Over the first two months of 2015 the police imprisoned around 20 activists for short terms between 5-25 days. Following this, on 26 February the trial in Mahileǔ extended anarchist Mikalai Dzyadok's prison sentence for ​another year. This happened just a few days before his planned release. Mikalai Dziadok is on a list of six Belarusian political prisoners that the Minsk-based human rights group “Viasna” have made public. Four of the six political prisoners, including Dziadok, have declared themselves to be anarchists. They were sentenced to prison in 2010 and 2011 after several attacks on the Russian embassy in Minsk and a KGB office in the city of Babruisk. The heavy-handed suppression of peaceful social and political activism in the 2000s pushed the next generation of anarchists to become much more radical in their tactics. This shift can be seen in the a handful of symbolic attacks on state institution buildings and a casino over 2009-2010 by local Minsk activists. According to the web page of Revolutionary Action – an Belarusian anarchist organisation – these attacks designed to avoid harming anyone, and were rather a part of a strategy to draw society's attention to social issues, such as military conscription, abuse of power by the police and other issues. The KGB arrested a number of radical youngsters after an attack on the Russian Embassy in Minsk. On 31 August 2010 an unidentified individual threw a Molotov cocktail at the Russian diplomatic mission in the capital. A virtually unknown anarchist group “Friends of Freedom” claimed responsibility for the attack and declared that the attack was an act of solidarity with anarchists detained in Russia. A fair share of commentators in the media have since expressed their doubts that the Minsk anarchists were really involved in the incident and regarded the attack as a provocation. In autumn 2010 the police detained and interrogated around 50 activists as part of the so-called "Anarchist Case". Some of the activists fled abroad. Yet, on 28 November 2010, the secret police in Moscow captured and delivered to a KGB prison in Minsk one of the accused activists, Ihar Alinievich. The court sentenced Ihar Alinievich to 8 years in a high-security prison colony, while another individual, Mikalai Dziadok, got 4.5 years and three more anarchists were sent to prison for 1.5 – 4 years. None of them confessed to the embassy attack. During the investigation anarchists from all over the world demonstrated their solidarity through local protests. One of the most radical protests took place in Babruisk. On the night of 17 October local anarchists attacked a KGB office by setting fire to the entrance of the building. As a result three young activists were sentenced to 7 years in prison a piece. These court rulings have completely dismantled the local anarchist movement. Still, their repression has attracted the attention of the Belarusian public. They have even classified these symbolic attacks on buildings as mere misdemeanours, not felonies. Anarchist groups have been largely inactive over the past couple of years, limiting their public activism to graffiti and 5-10 minute long pickets of the police for the continued repression of the left. Over the first two month of 2015, the police imprisoned around 20 activists for span of between 5-25 days on various charges. 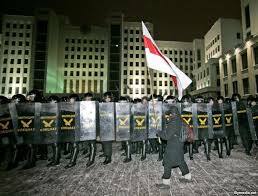 On 10 January in Minsk, riot police assaulted a local punk-concert. Several dozens youngsters were detained. Two of them were put in jail for 10 days for resisting arrest. Officially, the riot police were on a narcotics raid. Later on, however, the police arrested and locked up several activists for a few days that came to the prison in order to pick up their peers who had been arrested at the concert. Finally, on 26 February a Mahileǔ court extended the year prison term of Mikalai Dzyadok by an entire year just several days before his planned release. According to the authorities, Dziadok systematically violated prison rules by wearing sweatpants instead of the official prison robe and for walking around his cell after lights out. Commentators on social media and anarchist forums link this wave of repression with the upcoming president elections scheduled to take place this year. They assert that the authorities are afraid that the anarchists will organise protests in opposition to the elections. Despite the state's fears, anarchists clearly do not have the numbers or support to mobilise thousands people to take to the streets. 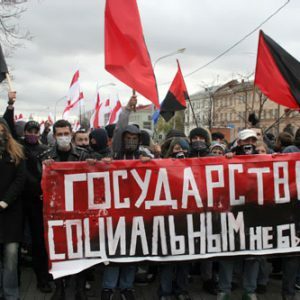 Tatsiana Chyzhova – a research fellow at Institute of Political Science “Political Sphere” based in Minsk and Vilnius claims that “despite the fact that the anarchists recently engaged in protest activities, the movement is in ruins. At best, they bring together around a hundred followers of anarchist subculture [at any given time]”. By intimidating social activists and radical leftists, the secret police are looking to quell any protest during the election campaign. Moreover, by extending Mikalai Dziadok's prison term, the authorities are showing that they do not care how the EU will react, as they are concerned with more important issues than anarchists trapped in Belarusian prisons. Vadzim Bylina is a researcher at the Institute of Political Studies 'Political Sphere' based in Minsk and Vilnius.